Father Fermin Francisco de Lasuén was a Spanish missionary who came to California in 1761. He founded nine missions and served as Father-President of the California missions for 18 years. Lasuen was born on June 7, 1736, at Vitoria in Cantabria, Spain. He was a man of symmetrical build with light, somewhat red skin, a pockmarked face, dark eyes and dark, curly hair. He became a Franciscan priest in 1752. In 1748, he and volunteered to work in the American missions. He arrived in Mexico in 1761 and went to lower (Baja) California in 1768. In 1773, he moved to "upper" California. He arrived in San Diego on August 30 and stayed in San Diego until June 1775, when he moved to Monterey. In 1775, Lasuén and Father Gregorio Amurrio were appointed the first missionaries at Mission San Juan Capistrano. When they arrived, he said Mass and established the mission. Shortly after that, news arrived that Indians attacked the mission in San Diego and Father Luis Jayme was murdered. The soldiers and missionaries hurried back to San Diego. There he built a new church and enlarged the mission compound. 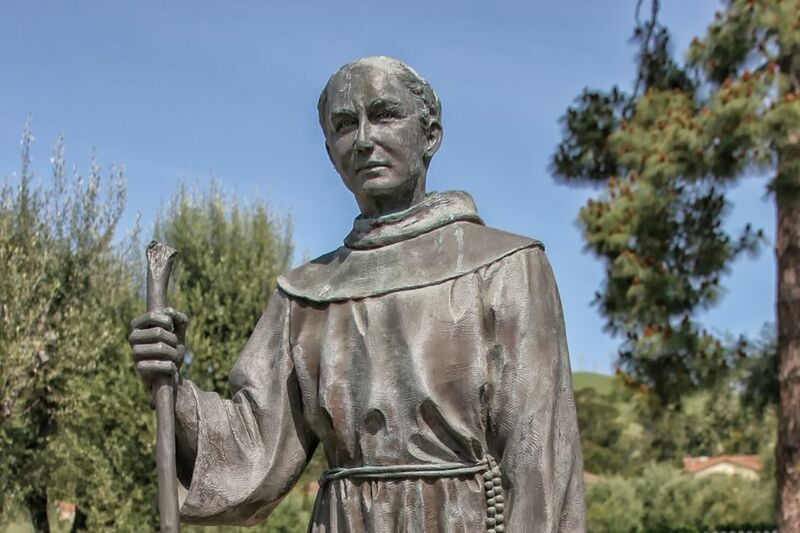 In the summer and fall of 1776, Father Lasuén went with Father Serra to San Luis Obispo. In 1777 he was appointed the minister of Mission San Diego. Lasuen became Father-President of the missions in 1785 after Father Serra died. After that, he moved to the Carmel Mission and stayed there until he died. Lasuen was Father-President for 18 years, and he personally founded nine California missions. He also expanded many of the older missions. Because of his position, Father Lasuén met many people who wrote about him. Captain George Vancouver described him in 1792 as having gentle manners and a placid face. Alejandro Malaspina praised his good manners in 1791. Charles Chapman described him as a worthy successor to Father Serra. Father Serra himself called Lasuén a religious man of exceptional example. Lasuén was known as a good administrator. He served in California longer than the more famous Father Junipero Serra. About the work of a missionary, he wrote: "He is responsible for the spiritual and temporal welfare of people who are many and varied. He has individuals who are more dependent on him than small children, for there are many needs that arise... and many different things to be done for the different groups that make up the community. He is surrounded by pagans, and placed in charge of neophytes who can be trusted but a little..."
Lasuén never adjusted well to life in California and he repeatedly asked to be allowed to retire or transfer somewhere else. He said only obedience kept him here. Even as he grew older, he kept asking for a transfer or retirement. He never left California, and he died at the Carmel Mission on June 26, 1803. He was buried in the sanctuary there.